In September, Greenmarket Director Michael Hurwitz had the incredible honor and privilege to visit Bologna, Italy to speak at a conference framed around feeding the planet in a sustainable way. Here is a re-cap of the trip in his words. My presentation specifically focused on the many roles farmers’ markets play: creating centers of community activity, driving regional economy and providing meaningful opportunities for small farms to thrive, as well as educating children, consumers and policy makers on the issues associated with sustainable agriculture, and among numerous other benefits, piloting city-wide initiatives such as residential food scrap collections. And while the marketplace needs no introduction in Italy, their farming communities share many of the same challenges facing those here in the States. My most precious time on the trip was spent discussing potential solutions to those challenges with my dear host and ally, Paolo Russo, who I met years ago in New York City when he represented food producers from Italian mountain communities, working to have their products sold globally. 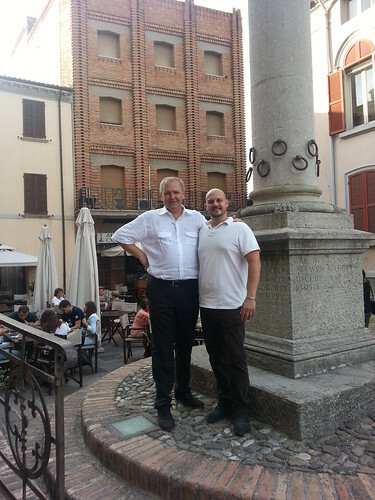 And the highlight, not just of the trip but of 2013, was the time I spent in Sarsina with Paolo and his colleague Lucio Cangini, the former Director of Mountain Regions in Italy. Now Lucio is a philosopher, activist, mentor, inspiration, and an artist: his painting, Trans-Democracy, a commentary on the changing nature of democracy inspired by the Arab Spring, now hangs on my kitchen wall. Our conversation lasted hours, most of which were spent over lunch at La Maschere, a slice of heaven situated in the mountains of Cesena. It’s times like these that I wish I had a sophisticated vocabulary- as I am incapable of adequately describing the culinary experience that chef Federico Tonetti provided that day. Our second course, the Squacquerone made with milk from the town, was like nothing I’ve tasted prior- freshness was redefined that afternoon; and when we told Chef Tonetti that we couldn’t possibly eat dessert after our Cappelette with speck and white truffles floating in a pigeon broth, he opened his “favorite” American wine, a Mondavi Cabernet, the perfect complement to the lamb chops stuffed with anchovy that quickly followed. That day was four men, two of whom spoke no English and one who spoke no Italian, bonding over the sharing of food and ideas. Lucio laments the cultural and economic loss of the traditional Italian mountain town, as younger generations leave the countryside believing their futures are elsewhere- you can see and hear the sadness as well the hope as he speaks. Together we discussed Greenmarket’s work to provide viable economic opportunities for farmers and the role we play in maintaining rural communities and farms, demonstrating to the next generation that there can be a real future in agriculture. 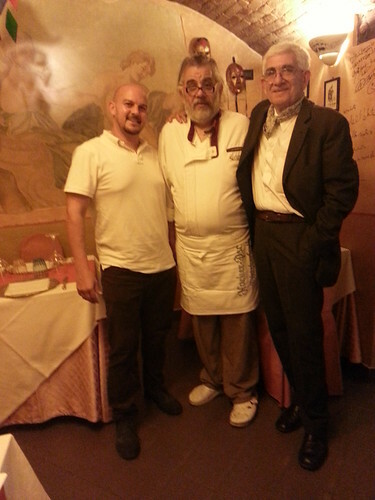 I cherish those hours we spent that day and I look forward to sitting with Lucio again, either here in New York or back in Italy- preferably- to learn from a sage who has seen such transformation in his lifetime and worked effortlessly to strengthen community. And I am eternally grateful to Chef Tonetti for his incredible generosity and providing me a culinary experience that can never be matched. I left Sarsina that day both physically and emotionally exhausted and exhilarated, thinking I was heading back to Bologna for a quiet last afternoon. I had no idea that part two of this incredible day was 45 minutes away in Bertinoro, a gorgeous hill town overlooking the Adriatic Sea. We were greeted by Giampaolo Amadori, a man larger than life, who is both the CEO of the Central University of Bertinoro as well as of the Foundazione Alma Mater Eventi, among the many other titles he carries. He’s basically The Man in all things Bertinoro if not the region itself. Giampaolo had arranged a special tour of the Interfaith Museum, located in the dungeon of the 11th Century Bishop’s Fortress, which is dedicated to promoting dialogue between Judaism, Islam and Christianity. From there we walked the town, and of course ended the day with yet another meal. And while it felt sacrilegious to eat after the experience at La Maschere, the Piadina extravaganza at the roadside stand was as perfect an end to my trip as one could hope. These flatbread sandwiches, stuffed with pumpkin, cheese and spinach, which of course I had no problem putting down, were a game changer. And the company and the conversation were pretty amazing too. These experiences did not occur in a vacuum, but rather took place in a context of exchange and education. I was invited to Italy to share my experiences and ideas how to address the gaps in our food system and the challenges that industrial production creates. 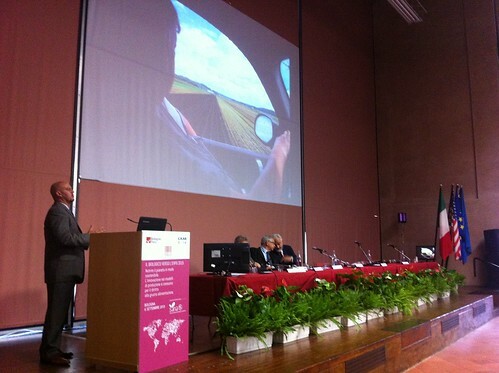 This event was organized by BolognaFiere and CAAB- the Agribusiness Centre of Bologna- essentially the equivalent of our Hunt’s Point Produce Cooperative in New York. It functions as the major fruit and vegetable distribution center of Northern Italy, though it is operated by rather different standards and organizational structure as well as guiding values. 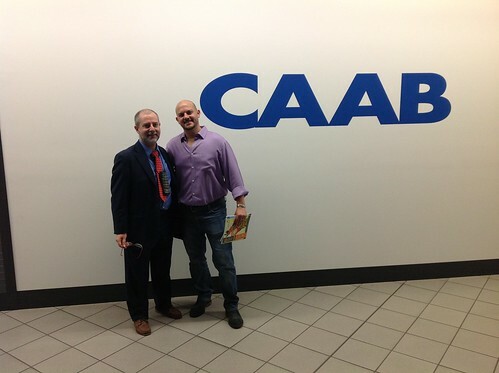 CAAB is primarily owned by the City of Bologna and the University; only 3% is held by the co-op members and banks. CAAB is a shining example of what is possible here in New York City, as this structure allows for the market to serve the best interests of all involved- farmers, distributors, consumers, and the houses. 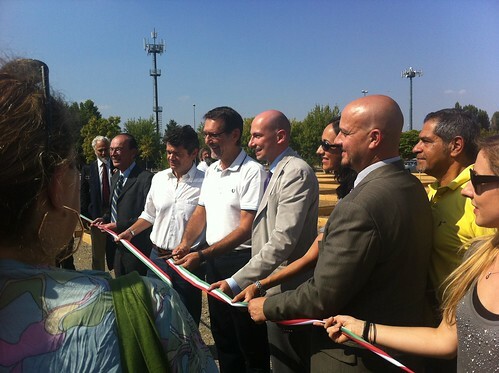 There’s even a community garden on its grounds that I had the privilege of helping to inaugurate with Bologna’s Mayor, Virginio Merola, during my visit. I am deeply grateful to Duccio Caccioni and Andrea Segré for welcoming me so generously and for their incredible work building a more just and sustainable food system. Andrea is the President of CAAB as well as the Dean of the Faculty of Agricultural Sciences at the Alma Mater Studiorum - University of Bologna and Duccio serves as the Marketing & Quality Manager at CAAB and is a regular contributor to Fresh Point Magazine. I look forward to continuing my and hopefully New York City’s dialogue with Andrea, Duccio, Mayor Merola, Lucio, and Giampaolo, creating real cultural exchanges and promoting the food capitals of the world while highlighting shared values and visions. 2014 has much to bring, and I am excited to bang heads with my dear friend Paolo Russo and guide some of that process.